In 1959, David Peterson, a professional aircraft designer, had a dilemma: he owned a travel trailer and a boat, but couldn’t tow them both at the same time. He dreamed of putting an engine under the floor of the trailer, and towing his boat with it. When the Corvair appeared that year, he decided to act on it. He rented a large garage, tossed out the trailer, started from scratch, and four months later out rolled the first Ultra Van, weighing a mere 3,000 pounds. It was way ahead of its time then, and it still is today. Which probably explains why it was a commercial flop. It’s a brilliant marvel of space and weight efficiency; if Colin Chapman, Buckminster Fuller, Ferdinand Porsche or Gordon Murray had been asked to design an RV, this is what they would have come up with. David Peterson deserves to join their ranks. After 1964, Ultra Vans came with the bigger 164 CID Corvair engine, in both 110 and 140 hp tune. Since a shift linkage was out of question, they still pumped through the Powerglide. For those more leisurely times, the Corvair engine did the trick, cruising happily up to 65 mph (on flat terrain). But by the late sixties Americans were getting power-hungry, and even with their RVs. So after the Corvair engine went bye-bye, Ultra engineers tested several alternatives. The Olds Toronado FWD power train was promising, and versions with it in the front and back (not both at the same time) were tried. These experiments led to an offshoot, the Toro-powered fwd Tiara, which if there are any left in the world today, would be quite a find. But the Ultra experimental department kept at it, and finally hit on a solution to replace the weak chested Corvair: “Corvette” power! But not in the Corvair-like configuration. As best as I can make out from the iffy descriptions, the small block Chevy sits in the back under a bed, and then sends its power to the rear through a Powerglide, then a marine V-drive sends it back forward to a Corvette independent rear suspension with disc brakes. These so-called “Corvette” Ultra Vans have sparkling performance wit their very un-RV like power-to-weight ratio. Mileage dropped to a still respectable 12 -15 mpg. Only 47 of these were made, of which some are still prowling the roads of America looking for stoplight drags with Chrysler 440 powered Winnebagos in order to settle an old score. It was all in vain; the UV was getting even more ultra-expensive, and Ultra shut its doors in 1970. Peterson tried to revive it with another fwd Toronado version, saying that if the Toronado had been available in 1960, there never would have been a Corvair UV. His ideas were picked up by others, including the second-most radical RV ever built, the GMC Motor Coach (above). Ultra Vans have an enthusiastic and loyal following, and some 200 of the 370 ever built are still on the road, or hoping to be soon. Obviously, there are challenges and limitations to Ultra Vanning: one has to travel lightly, since its total wight capacity is limited, especially with those little 14″ tires (early ones had 13 inchers!). This UV has obviously and wisely had its rim widened. There’s no air conditioner. The brakes are little unassisted drums. The tanks and complex sewage system can become problematic. At least there’s no power steering to get leaky. You get the drift: this is for minimalistic RVers, which would suits me fine. When I was young, I shared Peterson’s dream: whenever I saw an Airstream trailer, I imagined turning into a self propelled sleek and low RV. I became aware of the UV in the early seventies, and have played out many re-powering scenarios: a Porsche air-cooled six with a TipTronic with 911 suspension and brake upgrades was a long favorite. Now I lean more to maximum mileage: a Subaru turbo-diesel boxer (sold in Europe) is the current candidate. But how to change the rotation, after flipping the drivetrain 180 degrees? I’m convinced an UV would hit 30 mpg with a modern tubo-diesel. Its low clearance and lack of off-road capability, as well as the huge amount of time and energy it would take has so far kept me from Ultra-insanity. I’m rather intrigued with the idea of whether a modernized update on the UV would be able to find a market today. Perhaps one using the Prius’ hybrid drivetrain, or even an all-EV version, since every campground has electric hookups. No more fuel cost whatsoever! With a 100 mile range, one would be forced into leisurely excursions, but isn’t that the point? Solar panels on the roof and on a pull-out awning for charging batteries in undeveloped sites. My imagination runs rampant, like David Peterson’s. The trick is knowing whether to act on them, or not. Click this link to check out the 200 other Curbside Classics. "17 Million Cars A Year In China? Forget About It"
"Burned Dodge Truck Makes Us Sad"
Ultra Van? Well naturally this is what the science patrol in Ultraman would have driven around Japan in 1966-67. They already drove a Corvair – 6 orange suits with helmets stuffed inside. Anyone else remember Ultraman? Ultraman? Heck, that’s first year stuff. Seriously, I grew up in HI and my first 20 years there were awash in early tokusatsu and sentai shows, with the occasional animated series brought over by KIKU-13, which was a dedicated Japanese language channel. Ultraman and its various iterations, the Kikaida series, the Kamen Riders and Go Rangers were among the many exotic flavors for my childhood television viewing experience. I agree the Ultra Van would make an ideal support vehicle and not simply for its name; the shape itself is a perfect complement to the “near future” props and models used in that series. What a find! It reminds me a bit of the “Spirit of Tomorrow”, which I saw at the Vancouver Expo. I know it’s off topic but… I am in love with that Caddy. Firstly – I can’t believe somebody guessed this one. Kudos to Joe McKinney! Secondly – This is why TTAC is the first site I view, each and every day. I learn something new just about every day! I had no idea the Ultra Van existed until now. This RV almost makes too much sense. It’s brilliant engineering. A low floor pan due to the Corvair chassis, and exceptional mileage (although rather underpowered even by contemporary standards) make this a no-brainer for ecologically-aware RVers (there’s a serious dichotomy!). A Porsche sourced air-cooled six would contribute more than adequate power, albeit with a weight penalty, and if a person so desired, retrofit proper disc brakes, and even A/C. Rear engine, rear drive vehicles do not require power steering. Keep day-dreaming Paul, and maybe one day you may realize your dream of owning one of these, and adding your numerous upgrades. Love the blue dual pinstripe on the 59 Peterson.. all that was needed to make allwhite more catching – chevrons, speed whiskers..? Can’t say I care much for the side profile with those misaligned windows – guess practicality counted over form. Love the vistavision view through the front. But how about that side swivelled driver’s chair in lounge mode – someone gets hipster rim. I wouldn’t like to tack this bulbous lightweight in a windstorm. Towing a boat with a Corvair-powered RV? And people think I’m crazy for towing 4400lbs of trailer and race car with a Flex! This is an outstanding illustration of how much slower effective freeway speeds used to be in the United States. I doubt the UV could go or stop well enough to keep up with Chicago, DC, or New York metro freeway traffic, and in the Midwest it wouldn’t have enough vMax to move out of the right lane. In an era where people still occasionally used prewar cars to get around, however, this wouldn’t have been the slowest thing out there. Paul, I think the way to go with yours is the new RUF small-displacement V8 and Porsche G50/6 transmission. Jack, regarding freeway speeds and such: I’m old enough to remember what they were like. In the most states, the interstate speed limit (pre 1973) was either 75 or 70 (80 in Kansas). And left lane traffic generally went at that speed (if you didn’t want a ticket; you couldn’t assume a ten mph grace back then). But right lane traffic was definitely slower: 50 – 60 is pretty much all what the big trucks could do back then. There was much better lane discipline, and very few left lane bandits. And other slower vehicles (Ultra Vans, etc.) happily coexisted. Keep in mind that outside of major cities, the freeway traffic level was drastically lower then. Ultra Van owners still ply the country, successfully. They probably don’t spend a lot of time in urban areas with them though. In the open West especially, I have no problem bumming along at lower speeds in my old Dodge camper; I often set the cruise control at 58 or so, without tying up traffic. I forget what the traffic is like back East nowadays unless I (reluctantly) find myself there. I remember Gordon Baxter writing that the Texas Highway Patrol MIGHT “give you five” if the trooper was in a good mood. It’s interesting to consider the idea that the limits used to be more reasonable but more rigidly enforced. I’d prefer it that way; consistent enforcement of laws breeds respect for the law and the man enforcing it. How fast do you think the UV could pull a typical leisure boat of the era? I’m thinking 60, tops, but I could be wrong. Traffic outside Toronto this afternoon was running at a steady 80-85 in the middle lanes. I briefly went up to 95 in the far left lane, which is grounds for vehicle confiscation here in Ontario, and had to move over for two Cambodians in an IS300. Regarding towing with an UV: I think Peterson may have been one of the few who ever did that. Let’s face it, the UV was not really suited for that. I suspect his boat was fairly small and light, like they more commonly were (often out of aluminum too). But I don’t think any of the current UV owners would even consider that anymore; I wouldn’t. Maybe I’m a bit off-topic, but I would love to read more about Jack’s recent experiences driving around Toronto. It can be ruthless, but in the right conditions the majority of drivers will go with the flow at 80 mph. The speed limits around here top out at 100 km/h (60), although historically they were at 70 mph, and it’s an open secret that the design speeds are 130 km/h (80) or more. I wondered if we could get a copy of the article to use in our newsletter, Tin Can Tales. We have a number of members that own UltraVans and it would be of interest for all our readers. is like every invention being before its time. only thing there isnt any ICE around then, need something like 9 persons’ strength to get her off the ground but that alone cannot support the 9 peoples’ weight. Even Lasers were discovered by Einstein but the propelling force didnt materialise until 40-50yrs later. Now lasers were so small could be fitted in your pocket. Even at 60s the Goldfinger’s laser was huge. That’s because before Mr. Bond could “die” (always loved the way the Gerd Frobe voice-over rises in pitch on that word), the laser would have to cut through two of 007’s tungsten carbide balls. I love oddball RVs. That is definately cool, but I don’t think I’d trust it here in Chicagoland where the speeds range from 80+ MPH to dead stop in a milisecond..
My buddy picked up a 72 Rectrans Discoverer last year in a “get it outta here” deal. She’s odd looking and in rough shape but will for sure be cool if/when done. Wow, necessity was the mother of invention. Too bad things didn’t work out better for him, although back in 1999 my supervising professor for my student teaching had one of the last year of production FWD GMC RVs. I’ve been aware of these for some time, but I think this is the most information I’ve seen about them in one place. Thanks for the great find! Yes, their smallest model (shown) did. But they quickly switched to Dodge truck chassis. Perhaps you should keep your eye out for a Vixen 21TD. They were built in the late ’80s with many of the same objectives as the UV. The drivetrain was a rear mounted version of the BMW 524TD engine coupled to a 5-speed manual transmission. As the name indicates, it was 21 feet long. They used a retractable roof to keep overall height to 6 feet for parking in suburban garages. Some estimates say as many as 376 were built and I’ve seen 3 in San Diego in the past year or so. Two of them were behind La Jolla independent BMW where one might hope they weren’t being used for diesel parts. I meant to mention the Vixen, as I’m quite familiar with it. It’s an interesting vehicle, but not as ambitious as the UV. It rides on a conventional frame, and as a result, has some shortcomings, the biggest one being lack of stand-up room, which is a deal breaker for me (pop-ups don’t cut it). Also, it’s less wide and roomy all the way around. And there are some questions as to its structural integrity/build quality. It may work for some, but not for me. When I find one, I’ll do a CC. I had never heard of a Vixen before reading the above post, and then lo and behold, tonight I saw one on the road right here in Savannah, GA (it had CA plates). The photos on the Vixen site, showing the vehicle in isolation, do not give you any idea of how freakishly low it is. Many modern pickups and SUV’s are taller. In traffic the impression is of some futuristic stretched forward control van. Paul, I think you’re close with the Prius suggestion. You would want some sort of ICE on board as the last thing you’d want is to be stranded halfway between recharging opportunities. I think the upcoming Volt drivetrain would be absolutely perfect. Throw in a few more banks of high quality (Lithium?) batteries, and maybe you could run all-electric for a hundred miles or so but still have the gas engine to get you further. Power level and gas-only efficiency might not be up to your hopeful standards, though. Rear-mounted BMW 2.4l Turbo diesel complete with 5spd stick, only 6′ tall but with a popup roof for walk-around space. Excellent handling, but iffy build quality. Saw one of those for sale couple of years back here in Alaska. Had no idea what it was but was fascinated by to the point that my wife was starting to select another way home just to avoid listening to me rambling about it. It ran and was being sold for a pittance by a guy that fixes and sells beaters for a living. Hope it went to somebody that appropriates it and keeps it on the road. But how to change the rotation, after flipping the drivetrain 180 degrees? Simple.. flip the transaxle upside down. Ultima cars does that with the porsche transaxles they use. This may be a bit off topic but I’ve been wondering if the new Ford Transit Connect could work as a minimalist RV. I know it’s way smaller than these things traditionally are so I’m envisioning small boat-like accommodations rather than room to sprawl. I thought about this because the thing seems tall enough to stand up inside and would be radically better in terms of mileage. If there isn’t a diesel version yet here in the U.S., maybe Ford would consider it for this application. No need to tow a ‘dingy car’ behind it. What do you folks think? Does this idea make any sense? The weight figure is astonishing; add a couple of passengers and some cargo to today’s compacts and you’re very close to, if not over, the UV’s starting weight. I love the people who bring wonderful things into this world because they saw the possibilities we could not. I don’t know what current safety standards apply to today’s RVs, but I’m certain a modern shell using aluminum and fiber composite layers could meet them. Nice article David! I am fanatical about Ultra memorabilia, but I have never before seen the two black-and-white promotional stills you posted. Where did you find them? FYI, there’s a fellow in SoCal who converted his Ultra with a Porsche engine – it’s very nice! And one Ultra Vanner regularly tows his ski boat with his coach, with an Olds 455 conversion in the rear (Corvair Ultras mostly just tow small one-or-two wheel utility trailers). And there are still a half-dozen (out of 48) Tiaras operating. The Travalon was a licensed version of the UV, with a different front end cap, and only a handful were built. Thanks Paul! Sorry about the dup post. Very pleasantly surprised to see the UltraVan featured! I looked for one for awhile a few years back, but finally went for the 1972 Revcon (seen here as my avatar). It has the aluminum construction, flat floor, Olds Toronado FWD setup, very comfortable and powerful. In a way it was the prototype for the GMC FWD motorhomes. Yes, the Revcon was an important evolutionary link indeed to the GMC. I was going to add it in the text, but I had to stop somewhere. There are some other interesting RVs from the days when there was more experimentation. Enjoy your Revcon. This would seem to be a rather perceptive concept which could be a viable way to take advantage of EV. Given the proliferation of RV campgrounds with electric hook-ups, it would seem to be a no-brainer to come up with a GPS set-up similiar to what the Leaf has, i.e., the vehicle will tell you exactly how far you are from the next electric hook-up and whether you can safely try for it or not. Unfortunately, I can’t imagine the market being anywhere near large enough to justify the R&D cost for such a vehicle. It’s a shame because it really seems like a great idea. A great read Paul, thanks! The GMC Motor Coach was always a favorite of mine. It was such an advanced design compared to the Winnebagos of the day. I thought the aesthetics were excellent too … GM industrial design almost up there with the Scenicruiser and F3/F7 Locomotive. In the summer of ’75, I was amazed by how well they handled. We were on a family vacation loaded to the max with kids and camping gear, and we found ourselves following a pair of the GMC coaches over the Lassen Peak Highway in Lassen National Park. They were traveling together. They were very well driven. They were very smooth … and they were hustling. Following behind, it was a thrill to watch them barrel through the banked switchbacks nose-to-tail and then power up the next segment of the grade. That image made a lasting impression … I still see it quite clearly. I wanted one. I still want one. Totally agree. I’m hoping to find one before long. It was an example of GM engineering and design capabilities at their best. I think they just called it GMC Motorhome, not Motor Coach (that’s the way it’s identified in the press images I got from GM Media Archives to use in the article I did the other day on the Motorhome and the later Toronados). It was bigger and probably more luxurious than the Ultra Van, but quite interesting in its own right — FWD, fully independent suspension, aluminum and fiberglass body, highly aerodynamic (given that it has a frontal area roughly the size of Honduras). The GMC MH is almost exactly the same height and width as the Ultra Van, and only slightly longer. The GMCs were 23′ and 26′ long and the typical UV was 22′ (though there were a few longer Ultras built too). OTOH, the GMCs are roughly three times the weight of an Ultra and much more mechanically sophisticated. Though a well-sorted UV will ride more comfortably than a GMC, according to owners. Thanks for the nice article, Paul. Just wanted to point out that there is at least one Porsche powered UV, a few of the Toronados, some water-cooled v-6’s and others besides the Corvair powered ones. A few have wilwood 12.2″ disc brakes, some have air suspension, air conditioning, power steering, computer controlled fuel injection, and a host of other upgrades which make them nice highway cruisers even now. I expect to attend my own funeral in #460, many years down the road. I assumed that others had taken up the possibilities of upgrading and modernizing the UV; awesome. Have you ever considered doing a CC on one of the pickup truck bed mounted campers? I don’t know if you see them in your travels, but I always thought those came close to the second-car/RV paradigm, along with the mini Winnies that came out in the late 70’s (I think). They were mounted on (mostly) Toyota chassis and looked much like the pickup truck bed mounted RVs of the 60’s, but were a true RV, as there was no way to detach the camper part from the chassis easily. Just a thought. Thanks for showing me something I have never seen before. The CC’s are truly my favorite part of this site. Thanks! I have thought about going solo from time to time. We’ll see…. 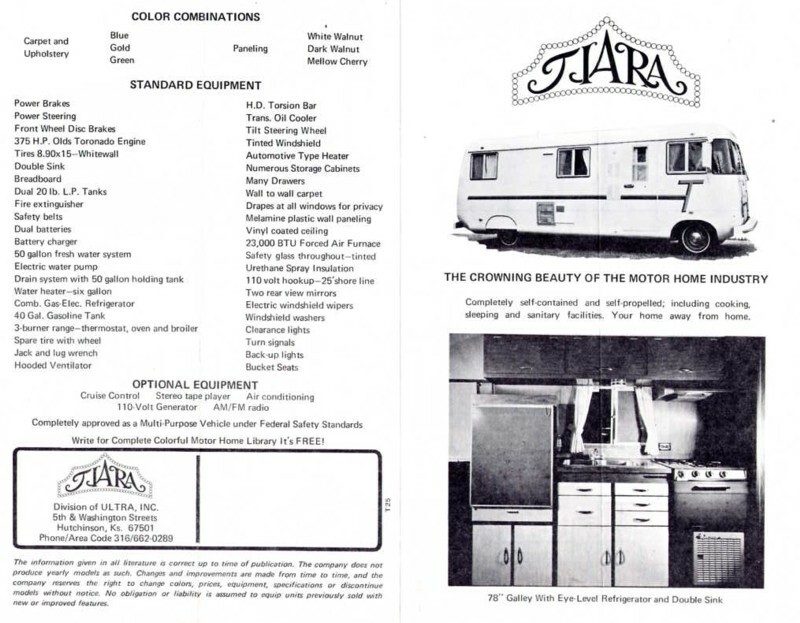 The history and development of RVs is fascinating to me. The small Toyota Chinook was briefly shown and mentioned here: https://www.thetruthaboutcars.com/2010/02/curbside-classic-1975-toyota-hilux-pickup/ I have shot a number of old pickups with detachable campers, but haven’t gotten around to them just yet. Stay tuned. Americans that bought Winnebagos in 1966 were much smarter than Americans who buy a Volt or Leaf today. Gas was inexpensive. Most motorhomes never see 100,000 miles. Buying a twice as expensive motorhome with inferior accomodations to save a couple hundred bucks a year on fuel would be as stupid as buying a twice as expensive compact sedan in the hope of saving a few hundred bucks a year on energy is today. Man, I couldn’t agree more! I’m all for letting people choose, which is why I’m opposed to the CAFE standard and subsidies for inefficient products. This was a truly delightful find. I had never heard of it, but it seems to be exactly what I had always hoped someone would make. The Vixen was already mentioned here – for several years, there used to be a dark silver version parked in the dirt where Old Middlefield Road turns into a ramp to Highway 101. It was in poor shape, but it still looked fascinating enough for me to walk over to it once to see what it was. Sadly, it was gone when I went by there a few months ago. Great story Paul. I am growing to love the nostalgia around old RVs. Someday, can you fill us in on the history of the GMC motorhome? Another thought comes to mind: Since this is an incredibly light motorized RV, one wonders how light RV trailers could be made and still be durable. How much over-engineered, over-weight, are the current round of RVs? European travel trailers are commonly towed behind middle-sized passenger cars, and they have been carefully engineered to be as light and aerodynamic as possible. Hey I’ve been lusting over the Hobby Caravans from Germany for a while. Meanwhile we have a 1978 VW Westfalia with Corvair power. Still don’t want to buy anything expensive and RV like that has to spend it’s life sitting outside. Need a pole barn at least. A thing of beauty – thanks. One question: weren’t/ aren’t airstream trailers built using aeronautical engineering? Airstreams sit on a conventional ladder-type frame. The body structure uses aspects of aeronautical construction (aluminum skin), but it’s not a self-supporting (monococque) structure. Despite its advanced construction the Ultra Van looks like crap. If you’re going to use 21st century technology then at least try to make the damn thing look better than a K-Car with a fibreglass body. Awesome. Although the shape of the thing seems designed more by an engineer than a designer. I went to Wiki to check about the GMC. Also awesome. I think I’ve seen those in very small numbers here. I remember from my childhood some K5 Blazer ones, and a lot of square ugly ones. I guess what happened with GM’s blueprints for the Motorhome. It seems like there have already been some latter day UVs. The Vixen http://www.vixenrv.com/description.html from the 80s with similar styling and 25mpg from a BMW turbo diesel seems fit the mold. The VW Eurovan based Winnebago Rialta from this decade is also close. Although they are closer to the truck based RVs in concept the new Itasca Reyo class A based on a Mercedes Sprinter is also a smaller more European style motorhome. Good article-these are the vehicles that really pushed the limits back in the day. I’ve never heard of this Corvair based RV before today-great read.